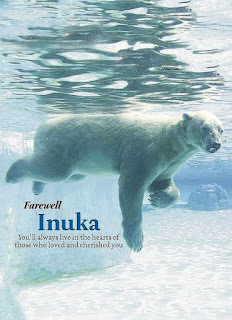 Singapore's last polar bear, Inuka, has been put down on “humane grounds” after a second health examination in three weeks found that its health had not improved despite intensive treatments. The 27-year-old polar bear was put into “deep sleep” under anaesthesia at around 7am on Wednesday (Apr 25) and was not revived, said Dr Cheng Wen-Haur, deputy CEO and Chief Life Sciences Officer of Wildlife Reserves Singapore (WRS). Any form of treatment would have caused him more stress and prolonged his suffering, Dr Cheng added. Singapore Zoo will not bring in any more polar bears, says Wildlife Reserves Singapore. Hopefully, one day, Singapore will also have such a rule for humans to die if living is such a painful suffering for them.